Romualdo is asleep in the Forest of Oread when he awakens with a start from a nightmare in which he was fighting several Drakes, until a mysterious Knight, dressed in red, came on scene and helped him defeat the Drakes. Romualdo is surprised to see in the knight the eyes of the girl he met in the forest and whom he cannot forget. Before the young king can approach the Knight, the White Fairy appears to him in his dream telling him to search for those eyes.Romualdo proposes to the king of Tuan that a combat be held between the best warrior of that kingdom and himself. The winner will determine who wins the conflict between the two kingdoms and thus end the war forever.King Hadrian accepts the challenge made by King Romualdo and convenes a tournament in which the best warriors of the kingdom will participate and where the representative of Tuan will be selected.When Fantaghiro hears the news, she tries to earn a position in the tournament. Almost immediately her father forbids her to do so, making our heroine greatly frustrated.Once again it will be the White Fairy who will intercede on Fantaghiro’s behalf and to whom she will make a gift so she can enter the tournament.The Black Witch will also intervene in the tournament. Her dark master, the evil Darken, will warn her of the danger it would mean if Fantaghiro were to win the tournament. If this would happen, Fantaghiro would know Romualdo and love could be rekindled between them, endangering all of Darken’s evil intentions. 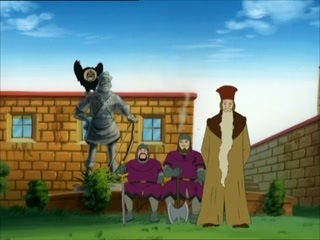 Thus, they will send to the tournament a powerful Black Knight who will use all his dark powers of wizardry to fight the other contestants.In an exciting combat, the Scarlet Knight and the Black Knight will be the tournament finalists in a duel in which the peace between the two countries will be at stake and in which there can only be one victor.